We Offer FootBalance Custom Footbeds! Offers greater support for high impact activities. It is also suitable for more robust recreational users and performance athletes. Features a stiffer core designed to give more support for individuals with excessive overpronation. An excellent choice also for those needing more support in stiffer footwear such as steel-shank hiking and mountaineering boots. Benefits: Very high cushioning combined with solid support Perfect for Excessive to severe overpronators Heavier individuals High-impact activities Stiffer footwear FootBalances’ innovative 100% custom made products bring you the benefits of custom orthotics at an affordable price. With FootBalance 100% custom made products you get a complete in-store foot analysis and custom molded footbeds/footwear in approximately 10 minutes. Offers maximum performance for pro or active skiers, skaters and snowboarders. Developed with members of the Finnish Alpine Ski Team, resulting in a super thin and stiff insole for the most demanding conditions. The sister model Race Heat is the first 100% custom footbed on the market with a built-in heating element from Therm-ic. Thin enough to comfortably fit tight boots and skates, making it suitable for any sport where tight-fighting, rigid soled footwear is used such as skiing, skating and cycling. Benefits: Efficient power transfer for better edging Slim profile minimizes additional heel lift Adds comfort and support to rigid footwear Perfect for Narrow, tight boots and footwear with a rigid or semi-rigid sole FootBalances’ innovative 100% custom made products bring you the benefits of custom orthotics at an affordable price. With FootBalance 100% custom made products you get a complete in-store foot analysis and custom molded footbeds/footwear in approximately 10 minutes. 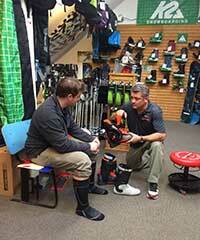 We know the right ski boots will make or break your day on the mountain, and so do our boot-fitters. That is why we guarantee our Boot Fits within one year of purchase. Benson Ski and Sport promises that you will be hitting the slopes in complete comfort. If you’re not, the answer is simple: we fix it; guaranteed. We confidently make this promise because our fitters are extensively trained to determine the right boot by analyzing the shape / size of your feet, along with your body type and experience, while congruently getting to know you, and your skiing needs and goals. Our store is home to all the fit equipment and machinery needed to execute alterations in-house by the experts that know you best. 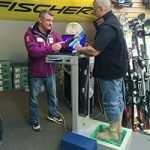 Boot footbeds are indispensable when it comes to the right ski boot fit. Even the nicest boots come with thin, floppy insoles because manufacturers expect them to be replaced. Trim to Fit footbeds made by Superfeet brand will help to prevent fatigue and provide added support and balance for your ankles and feet. We can accommodate even the most “interesting” feet. So, rest assured that you can count on our expert boot fitters with a combined experience of over 45 years, to help you feel comfortable on the slopes.